The P.D.O. Green Pistachio from Bronte is cultivated in small volcanic soils in the municipalities of Bronte, Adrano and Biancavilla in Sicily. Today, this precious "green gold" is a slow food presidium with an extremely limited production. 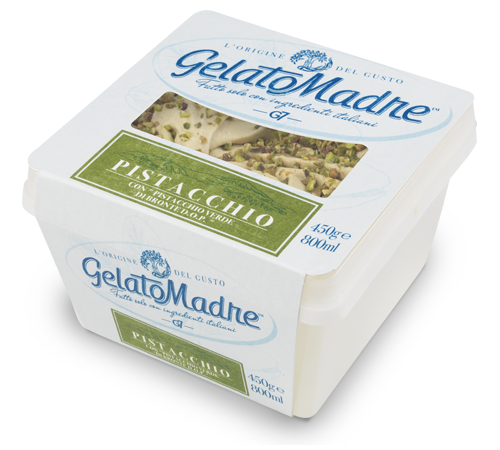 GelatoMadre Pistacchio is made with a selection of the best P.D.O. Green Pistachios from Bronte that confer the product an intense aroma and its natural and typical grey-green color. It is decorated on top with crunchy Bronte Pistachio grains. GelatoMadre Pistacchio with P.D.O. Green Pistachio from Bronte: only 100% Italian natural ingredients, for a unique Gelato going back to the origin of taste. This product obtained from DNV-GL the ISO 22005 certificate which guarantees the origin of the raw materials used. The authentic taste of a real traditional Gelato made only with few and simple Italian ingredients from certified supply chain.